Scientific name: Order Hymenoptera, family Formicidae, Potonomyrmex spp. Identification: Large red to dark brown ant. Thorax with one pair of spines. Long hairs forming beard under chin. Mounds are completely different from fire ant mounds. They are large and flat and have an opening. Biology and life cycle: Swarming is usually in June and July. Nests are always located in exposed soil, never indoors. Complete life cycle--eggs, larva, pupa, and adult. Habitat: Large bare areas free of all vegetation around the nest. Feeding habits: Eat seeds, especially small ones. Economic importance: Not considered a troublesome insect if plenty of native seed is available. The red ants are actually quite beneficial. They are in competition for space with fire ants and important for biodiversity by spreading seeds of various species. Natural control: Mulch and green cover crop. Birds, lizards, frogs, toads, horned toads, and other lizards. Biodiversity. Insight: Very interesting and beneficial ants. Be careful; they have a powerful bite and a powerful sting. They bite only when you disturb their mound. They are not as aggressive as fire ants, but their sting is more painful than a fire ant sting. 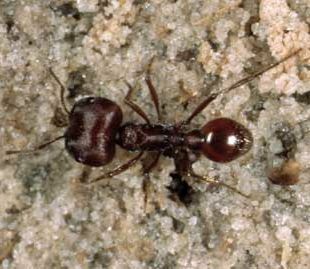 When treating fire ant mounds, avoid treating these ants. They should be protected. To move a mound of these beneficial ants, cover it with shredded mulch. The ants will relocate to a spot where the opening to the mound is again in full sun. Fire Ant Remedy - sprinkle a packet of aspartame (Equal or Nutra Sweet) on the mound. Ants will be gone the next day. Anyone eating or drinking anything containing this stuff is nuts!